It is through the high quality, high performance and the reliability of the products that Angus Fire has over the past two centuries provided to its customers which has given them the trust and confidence they needs to run a safe operational environment for their employees. Angus Fire’s commitment to minimising the environmental impact of its products is integrated back into managing and monitoring sound environmental practices within its manufacturing plants. These practices include energy management, waste minimisation, raw materials management and minimising environmental emissions. 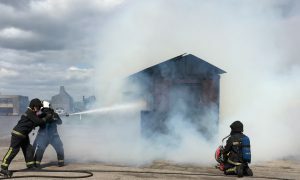 The ability to prevent, control and extinguish fires quickly and efficiently in today’s high risk and environmentally conscious environments is a key driver in all solutions offered by Angus Fire. From the development of risk mitigation plans to the provision of a 24/7/365 emergency foam service, Angus Fire is there to protect your most critical assets.